Swish!! That’s how it feels when I think of how fast a week goes by. I have to first say, I felt so much love from all the comments I received last week. I know we all live so far apart but our weekly visits are warm and wonderful. Thank you for embracing me into your circle of friendship. I am happy to report that my cold is nearing an end. I only have a cough that comes and goes but all the rest gone. So hate getting colds in the summer. Truly not fun. Enough whining I thought I would share an on-going project I work on. I should say on-again off-again project. It’s my Project Life. I completed last week’s layout (never happened before). I take the pictures and even write some journaling but never make it happen. Pathetic!! So I am proud to share this week’s layout. The first picture of my desk shows me making my own journaling cards. 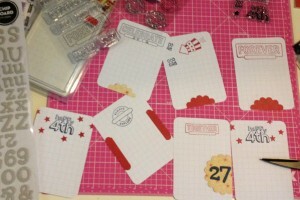 I used the blank gridline cards from Project Life and used Jenni Bowlin ink and some old stamps to make July 4th themed cards. On the left side of the desk you can see my new Smash album goodies. I still haven’t done much with mine but (shhh) enjoy buying all the goodies that go with it. I used some Thicker stickers and inked them to match to add the 27 for Week 27. I used my scallop punch to add more interest to the cards. 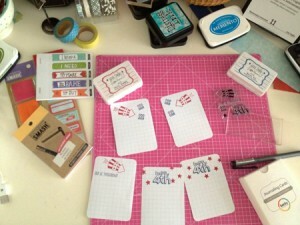 I found some more stamps along the way to make more journaling cards. The great thing was I found these old stamps in my stash that I got on clearance at Michael’s a few years ago and never used. So it makes me super happy to use them. Hope that cold will be totally gone soon. Your journaling cards look great!! Project Life used to be called Project 365 and the basic idea is to take photos throughout the week and then using the kit (which is optional) you put the photos in and journaling. It allows you to fuss a little less on embellies and focus more on the stories. Here is a link to Becky Higgins, she is the person who started this. I think you will like it. Let me know what you think. So glad to hear your cold has almost gone now. A summer cold is just so inconvenient. Your layout looks great and I hadn’t hear about Project Life before so all very interesting. Have fun and enjoy your projects! Happy WOYWW!